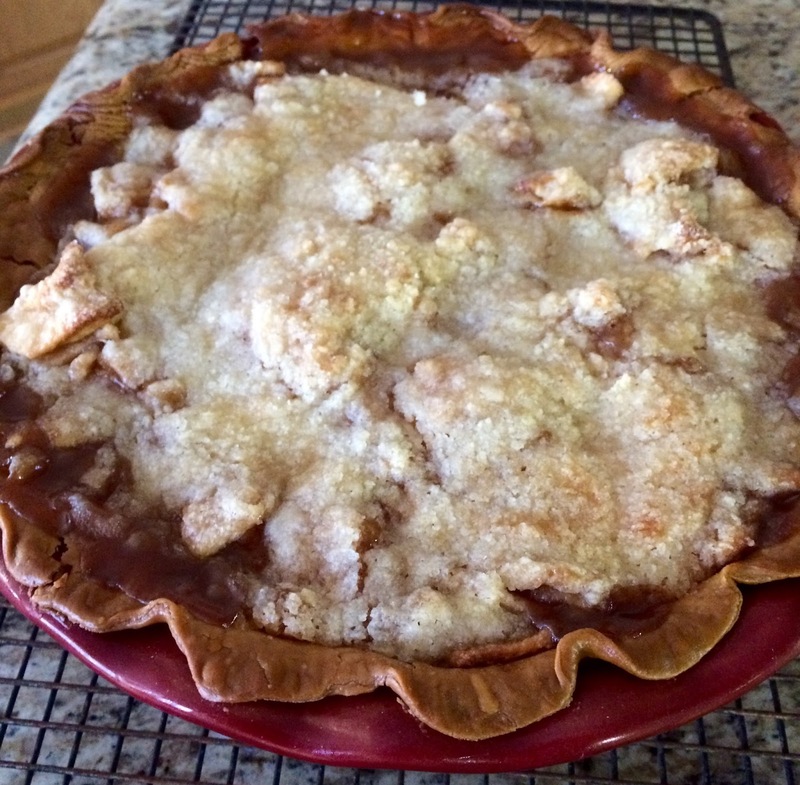 National Pie Day was last Saturday, and I decided to make a paper bag apple pie. I'm having some Almond Biscotti tea that my friend Margie, from Tea In The Valley sent me recently. Thank you, Margie! Oops, I can see my reflection in the glass of the fireplace! I'm using my Johnson Bros Friendly Village Ice House teacup. It's perfect for the chilly weather we've been having. Here's my apple pie, fresh out of the paper bag. I ended up using a Trader Joe's grocery bag, taking off the paper handles, and using paper clips to close it up. 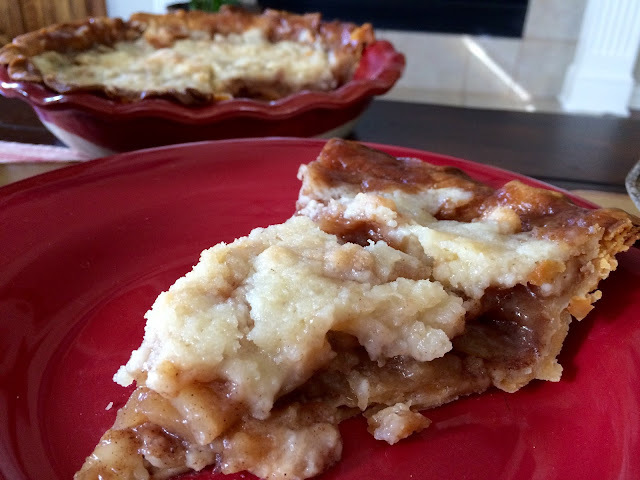 The pie was really tasty, and you can find the recipe here from King Arthur Flour. Even though I loved the flavor of the pie, I sooooo missed the wonderful smell of apple pie baking in the oven. Smelling a paper bag in the oven is, well...not my cup of tea! I liked the idea of precooking the apples in the microwave for five minutes before placing them in the pie shell. I will definitely do this again because I don't like under-cooked apples in my apple pie. However, I'll be skipping the paper bag method from now on! Hello Kitty, I too never heard of the paper bag method to make apple pie. You tea cup is pretty and the pie looks so good. Thank you for the review of this method, which I have never hesrd of. Thing is, if I had, I would have had to try it. You spared me! I despise anything less than a very tender apple in my pies so that method will work well...I usually just cook them on top of the stove for a while to take the crunch from them. Lovely tea cup! It's my all-time favorite. Hmmmm. I think putting the paper bag in oven would make me nervous, and you are right smelling it bake is one of the best parts. The pie looks great though! I never heard of this method before- how interesting. I agree an apple pie should be tender - I also despise undercooked apples in a pie. When I was a child I remember my mom always used a paper bag to put dinner rolls in the re-heat. It seemed to work but there is a fine line with using a bag successfully and going too far. 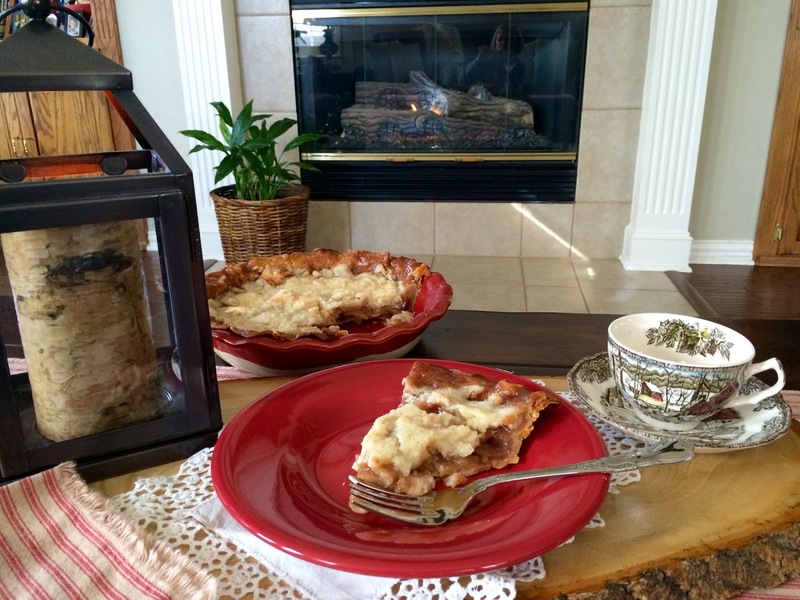 The pie looks delicious and especially cozy with the Johnson Brothers cup and tea! Mmmm your pie looks so delicious, and by the fireplace with a cup of tea - how cozy! Have a fun and creative week Kitty! Friendly Village is such a warm and cozy pattern...which a lot of folks have needed these last few days! I agree that baking apple pie is wonderful! I had to laugh at the paper bag in the title, so am going to check it out! Thanks so much for linking to Tuesday Cuppa Tea! I made one once, a long while ago. But then I read that the paper bags of today are treated, so that could be the off smell. As long as it tasted good, that is all that matters! Your pie looks wonderful and how unique. Love Friendly Village. So glad you shared Kitty! Haha, I don't think the aroma of paper bag would be very appealing either Kitty. Margie is a thoughtful blogging sister and likes to send little gifts when you least expect it, I'm glad she surprised you too. Well, Kitty, this is a surprise! I have never heard of apple pie baked in a paper bag before either. I appreciate your review and your honesty about the pie too. It does look good however. Love the Friendly Village teacup of course and tea and pie in front of a blazing fire this time of year would be a treat. Thanks for sharing and joining my little party. Kitty, I've never heard of apple pie baked in a paper bag before. So very interesting! I look forward to giving it a try when I get back from visiting my grandchildren. thank you for sharing this. You're very welcome, Kitty! This is the first time that I've heard of paper bag apple pie. How interesting! Love your Friendly Village tea set! My mom has a set of Friendly Village mugs that we scored at a local thrift store. I've been keeping an eye out for the matching cups and saucers and teapot during my treasure hunts! I like to smell the pie baking too. Apple pie is a favorite of mine. Sitting by a cozy fire with hot tea and apple pie appeals to me! Love your tea cup pattern. Comfort food and nostalgic pattern by the warm fire spells contentment. Blessings to you today. I have never ever heard of such a thing. Your pie looks mighty tasty. Warm with a scoop of vanilla ice cream? Everything is lovely, as always. Thanks for sharing with us at Weekend Potluck. Hi Kitty, your pie looks so delicious! I've not heard of this pie baked in a paper bag. Very interesting. The tea sounds so good too, I love anything with almond flavor. I have that same cup and love it. So pretty and cozy for cool days even though we've been lucky this winter with mild temps. We had a great time at Magnolia Market and I will do a post in about a week to share my thoughts and photos. Have a great week my friend. I love apple pie,especially with vanilla ice cream! Your teacup is simply elegant,love it! Hello Kitty, I can almost smell that delicious looking pie! Yum! I have never heard of cooking a pie in a paper bag. Thank you for trying it and letting us know not to do it, lol. I also love the smell of pie baking. 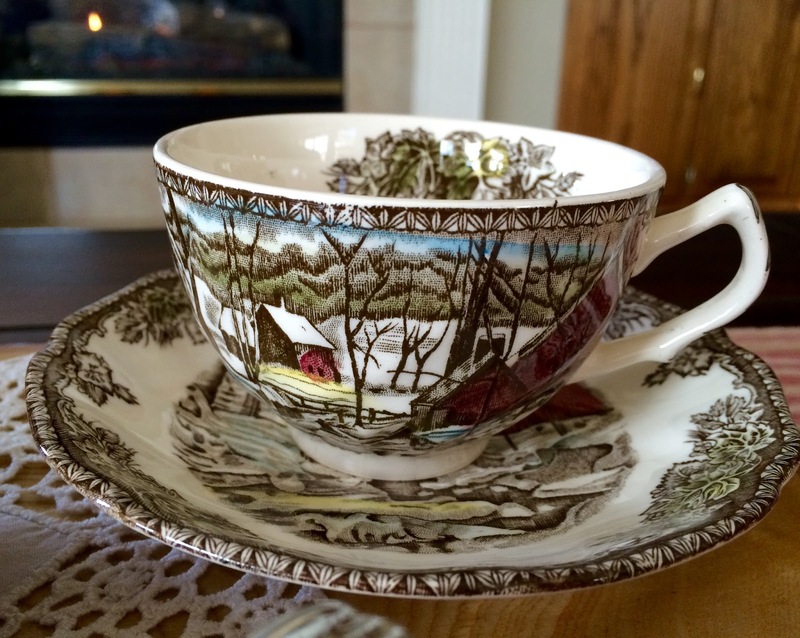 Your tea cup is one of my favorite patterns for winter, so lovely. I've also not heard of this paper bag method. But pre-cooking the apples sounds like a good idea. I never buy store bought apple pies because the apples are never cooked enough. Yours looks delicious with your nice cup of tea. And I love your pie dish. Thanks for joining Roses of Inspiration, sweet friend. You are such a joy. Love to you! No pie for me on National Pie Day, but your Apple Pie looks delicious. I have a friend who uses a paper bag when baking her apple pies and swears by the method, but I heard rumblings that it was unsafe because of lead in the ink printing on the bags and contaminants in recycled paper??? Your apple pie is photographed in such a cozy setting. Have a great week! Wow! This sounds amazing and looks so delicious! Now, that is a first for me. I have never heard of making a pie in a paper bag. But, I am definitely in the mood for making an apple pie now. Oh, my! You've no idea how much I'm craving a slice of that pie, Kitty. Sitting here with a cup of tea in front of a cozy fire, it is the one ingredient that would make my afternoon complete. ;-) Looks yummy, and your cup and saucer offers a cozy ambience. This looks so yummy! I could seriously go for a piece of that pie right now. My mother had a set of those cups (and the dishes to go with it). How lovely for this time of the year. Visiting from Foodie Friday. It's looks delicious Kitty! I have never heard of the paper bag method. Love smelling pie in the oven as well. Forgot to say thanks for sharing with SYC. That looks amazing and delicious! I've heard of that but have never done it -- your pie looks lovely! Happy Sunday Kitty. Hummmm...apple pie in a bag! I have never heard that one before. It does look yummy. I have a great caramel corn recipe you make in a bag in the microwave. Haven't made it for years. I used to make it for my kids YEARS ago. That pie looks amazing! Sure hope you are enjoying this sunshine we are having. Apple is my favorite pie, it smells the best! And your teacup is gorgeous. I love apple pie! Interesting method of baking....you mean you can't smell the apples and cinnamon baking away in the oven?!!!!!! It sure looks delicious though! Another beautiful teacup! You have so many!! !